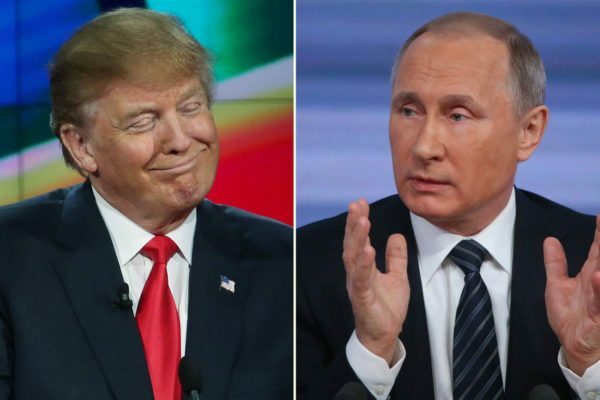 The House has voted to impose fresh sanctions on Russia, despite President Donald Trump objecting to the legislation. Senior Russian officials will be targeted in retaliation for alleged Moscow interference in the US 2016 election. The bill is likely to complicate President Trump’s hopes of improving relations with Russia. Russia said the vote could destroy the possibility of “normalizing relations” between the two countries. The bill needs to be passed through the Senate before it can be sent on to President Trump to be signed. The White House says it is reviewing the bill, and it is unclear whether President Trump will veto it. “While the president supports tough sanctions on North Korea, Iran and Russia, the White House is reviewing the House legislation and awaits a final legislative package for the president’s desk,” White House spokeswoman Sarah Huckabee Sanders said in a statement. Russia’s relationship with President Trump has dogged his first six months in office, amid allegations Moscow interfered to help him get elected. Donald Trump has also piled pressure on his attorney general over the Russia inquiry. He has publicly labeled Jeff Sessions “weak” and said he was “disappointed” in Sessions’ decision to recuse himself from the investigation. The legislation, which passed by 419 to three, was described by House Speaker Paul Ryan as a sanctions package that “tightens the screws on our most dangerous adversaries in order to keep Americans safe”. Stop President Donald Trump being able to singlehandedly ease the sanctions. The US already has a range of sanctions in place against Russian individuals and companies over Crimea. At the end of last year, following claims of election hacking, then-President Barack Obama expelled 35 diplomats and closed two Russian compounds in the US. The bill will also see fresh sanctions against North Korea and Iran over ballistic missile tests. However, the new measures against Russia have been criticized in Europe. On July 26, a spokesman for the Germany foreign ministry expressed concern, saying US politicians were conducting industrial policy under the guise of sanctions, according to Reuters. This version of the legislation still needs to be approved by the Senate, but it is not yet clear when it will consider the bill. However, if it passes through the Senate mostly intact, the bill would provide a headache for President Trump, who has signaled a more conciliatory approach towards Moscow. If the two chambers pass similar but slightly different bills, a committee will draw up a compromise version for approval. Once both House and Senate have approved a bill, it goes to the president to be signed into law. President Trump could veto the bill, but in doing so would fuel suspicion that he is too supportive of the Kremlin, correspondents say. The bill has widespread support from both major parties in both Houses – making a veto a potentially unpopular political move. Additionally, a presidential veto can be ignored if two thirds of both the House and Senate vote to override the president. The Kremlin continues to insist it did not interfere in the US elections. One Russian newspaper has described the latest sanctions as “punishment, without a crime”.